Art inspires my work every day. As a visual person, I pay attention to the colour palettes and also notice the feeling that the art inspires. Then I use that as inspiration in my work to stage properties that sell. 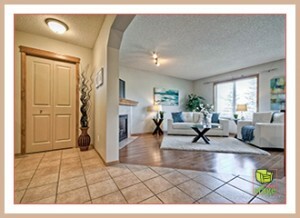 Done properly, using artwork for house selling can entice potential buyers with a sense of home. In my home staging business, I’m often advising people during consultations to de-clutter and remove personal photos/items – but not to go so far as to make the property feel lifeless. That’s how artwork plays a role. Selected strategically, and Hang Artwork Like a Staging Pro, artwork can be a perfect tool for creating a listing that appeals to buyers by making it feel lived in but not too personalized. After: We used an elongated piece of art to bring this hallway to life. Think about the sightlines and what feeling you want to suggest for that zone. In this Copperfield Photo Album, the blue is consistent in the two prints, but the red gives a kick of energy to the downstairs main living area and the calmer tones of beach and sand that greet you upstairs suggest a quiet zone for winding down at the end of the day. After: Laundry room after home staging. 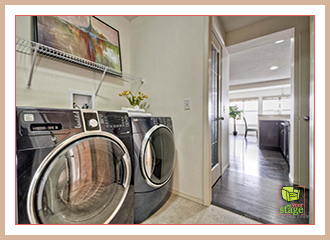 Artwork can go anywhere – 3 Easy Laundry Room Ideas for Home Staging! After: A welcoming front entry way. 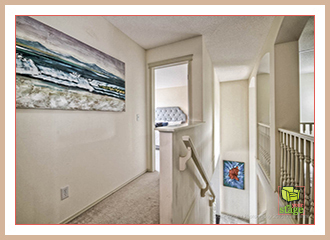 Place art where you want to draw the potential buyers’ eyes. In this Cranston Photo Album, placing art on both sides of the window draws the eye to visibly pull you into the space and to notice the natural light. I love to support local artists, but inspiration can come from anywhere (you can see some of the art that inspires my work on my Pinterest ‘Artwork’ Board). When you focus on the feeling that you want potential buyers to experience, using artwork for house selling can set just the right mood. For more staging inspiration, check out the various boards we have at Set Your Stage on Pinterest. This entry was posted on Tuesday, July 21st, 2015 at 3:21 PM	and is filed under Home Staging Inspiration. You can follow any responses to this entry through the RSS 2.0 feed. You can skip to the end and leave a response. Pinging is currently not allowed.